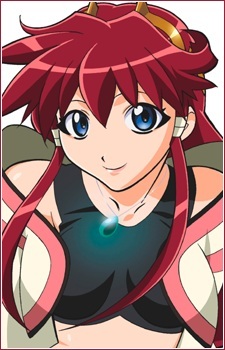 Dita Liebely is the female protagonist who is romantically involved with Hibiki. She refers to him playfully as "Mr. Alien" (宇宙人さん, Uchuujin-san), while Hibiki refers to her as "UFO Girl". Dita has a bubbly, lively personality that usually shows in almost every aspect of life, even when she is fighting (she refers to the enemy as "bad aliens"). She admits to having feelings for Hibiki since she met him in the first episode, and is subject to at least some ridicule and incredulity by her fellow crewmembers for her unusual infatuation with a male. When her Dread unites with Hibiki&#039;s Vanguard, they become the Vandread Dita-type Blue Kachina/Giant[Kachina literally means life bringer], a blue giant mecha that has access two powerful dual energy cannons, that acts as long-range or short-range weapons. She loves cooking for Hibiki and feels satisfied whenever he wolfs down her delicacies. While her character is childish, she received a co-leading rank, just under Jura and Barnett. She admits that the reason for her bubbly attitude is to keep the people around her from being too sad and serious at the events happening around them. As a child, Dita often daydreamed about aliens who would take her away from the bleak world she lived in, which leads her to have an almost obsessive fascination with Hibiki, whom she believes is that alien. It isn&#039;t until the last episode in the second season that she finally calls Hibiki by name, and vice versa. In the manga adaptation, Dita is less childish, and addresses Hibiki by name, rather than "Mr. Alien" and he in turn refers to her by name rather than "UFO Girl". Also, there is only one Vandread and it is the form Hibiki and Dita share. It&#039;s fusion is also made permanent. In the Vandread Extra Stage Novel, it is reveled that after the end of the series, Hibiki and Dita get married and have a baby.